>The Haute diaper I really only chose because it was clearanced and the price was right. I didn’t really have high hopes for it, and that feeling was spot on. I got the mint color which is nice. The liner had a shape unlike any other I’ve seen. I am used to them being rectangles with rounded ends. 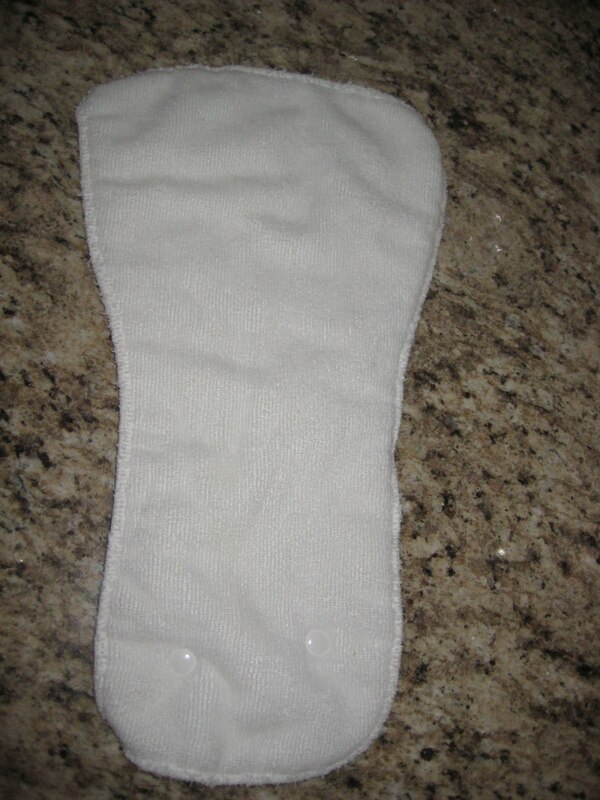 This was the same shape as the diaper, with big wings (very hard to explain). This made is very difficult to get in the diaper and incredibly difficult to get it in the diaper on the snapped down medium setting. It was square peg/round hole, trying to put something big into something small and ended up bunched up. Even with the liner all bunched up, it was still trimmer than the bumgenius. Like all the other velcro diapers, it was very simple to use. It seems to be a common theme here but the medium setting seemed larger than the medium setting of the BG. Really, there was nothing special about the diaper. I didn’t have any major problems, but I did notice moisture on my son’s legs at the leg openings when I changed him, and the laundry tabs seemed the most useless of all the diapers I’ve tried. Overall, I would continue to use this diaper, but it would be in the bottom of my stash, to use when all other diapers were dirty. It makes sense to me why these aren’t being carried anymore. Edit August 2010: I’ve heard quite a few people say that Haute Pockets are their favorite commercial pocket diaper, but they just don’t work for me. The oddly shaped insert means it’s always bunched up and ends up leaking. I keep meaning to try it with a different insert to see if that works better, but I haven’t yet. For now, this is in my “laundry day” diaper pile, since I finally have enough diapers to be picky about my favorites!